As soon as we quickly scanned the file at Chili’s, we called our social worker asking her to “hold the file” for us. This means that though other families might have seen the file, they could not pursue the child until we made a decision. We had one week to make a decision. Since we married, we have always made it a practice to each as individuals to try to hear the voice of God. Then, after a set amount of time, we share what we each believe God is saying. Time and time and time again God reveals His direction to both of us. This brings affirmation in what we each hear and helps us to practice the unity Jesus prayed for in John 17. This model places both responsibility and privilege on both of us. 1. Responsibility to grow in our ability to hear God, and 2. Privilege to both hear the voice of God. Together, we can then respond to God with courage and conviction. When we spoke to one another about what we heard, again we were surprised by what our individual time and how God connected it. I was drawn to Isaiah 6 due to Proverbs 20 speaking about the lips. Chad, because he was keeping the kids that day, couldn’t be still very long to hear. But he could not get the words, “Holy, Holy, Holy” out of his head. He didn’t relate it to the lips in this passage but God had directed us BOTH to the same passage. This adoption journey and this partnership with Chad makes me rejoice. I love that God wants to talk to both husband and wife and direct them together! I am so thankful that when times get tough (and they will) that we can look back on this searching as both individuals and as a couple to God’s leading and direction. During our lunch break, we went to a local Vietnamese restaurant (her province is very close to Vietnam) and ate noodles to celebrate our new daughter! Those little boots have been empty. 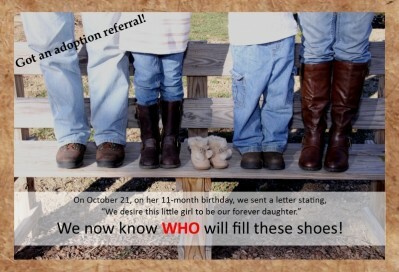 But now we know WHO will fill those shoes!